DARPA’s Tactical Technology Office has proposed a mission to repurpose apertures from defunct Geostationary assets, and Cubesats can play an important role in achieving the objective. The PHOENIX program’s goal is to develop a set of tools to detach and reuse the apertures from old communication satellites. Such tools include enhancement to a servicer spacecraft with robotic arms that will perform the detachment tasks but also the development of sets of small ‘Satlets’, or constituent pieces that are to be attached to the aperture to perform the required tasks. In our approach risk and costs can be minimized by careful utilization of COTS components, and CubeSats provide a standard platform that might facilitate the design. The Phoenix mission Satlets can base their architecture on CubeSat COTS components, from the bus structure to electronic components and solar panels, however, the operation environment beyond LEO is a complete new regime. The design of the satlets has very much in common with interplanetary CubeSats, can provide lessons to the Interplanetary CubeSat community and can learn much from it, from the different communication schemes to the approaches to radiation hardening. 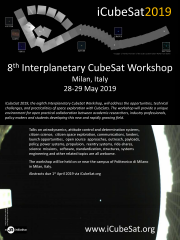 Our talk will provide a perspective into the design of the Phoenix program Satlets based on cubesat architectures, the advantages, disadvantages and expected results.